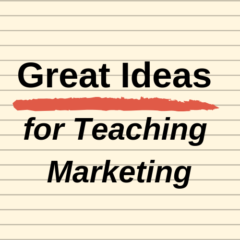 Great Ideas for Teaching Marketing has been developed by me, Geoff Fripp, over many years of teaching undergraduate and postgraduate marketing students. It was launched online in mid-2012. As an alternative to long case studies, I have constructed over 250 short activities and discussion exercises. They are ideally suited to topics that only require a 10-30 minute (on average, some activities run longer) exercise addressing a distinctive concept, rather than a detailed, all-encompassing case study. appeal to different learning styles.